In most professions, your competition is a pain in your neck. That’s certainly true in the business of TV news. But today I’m here to praise my competition. I might even say I’m thankful for them. But that’s just the tryptophan talking. The tryptophan reminds me of the time when, following the verdict in the Gold Club trial, we TV news goons were covering the exits at the Federal Courthouse, hunting jurors. The organized crime trial had lasted for months. The jurors had heard mind-numbing quantities of disjointed evidence. When it was over, many jurors were eager to vent. As they emerged one-by-one, cameras surrounded them and reporters asked them about the evidence. The jurors mostly stood and answered. And my photog’s camera died. Died, as in: Stopped working. Wouldn’t record video and audio. Wouldn’t roll when he hit the “REC” button. Thus, all this one-time-only material went uncaptured by WAGA-TV, which had covered the trial from start to finish. That’s when a competitor stepped in. Jon Shirek of WXIA-TV and I had listened to much of the Gold Club trial testimony together. We’d killed countless lunch hours together in the courthouse cafeteria. We’d compared quotes from testimony because the damned US Supreme Court won’t allow recording devices in Federal courtrooms. Shirek saw what was happening to us. He and photog Mike Zakel offered to dub and share their juror video. With no other options, I gratefully accepted. Funny thing is this: If Shirek hadn’t offered, I’m pretty sure Jeff Dore and / or Lyn Harasin at WSB would have made the same offer. This sharing-of-video isn’t exactly commonplace. But in a situation where exclusivity isn’t an issue — and where the competitor is facing an “it could happen to anybody” technical issue — such sharing is a back-alley secret that usually takes place with management never finding out. The payoff is Karma. I can’t remember the specifics, but I’ve slipped video to a few competitors in my day. They, too, were grateful. This unlikely competitive behavior apparently dates back to the early days of TV news. 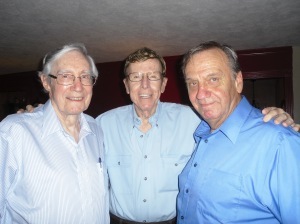 Don McClellan touchingly outlines a similar incident in his blog. 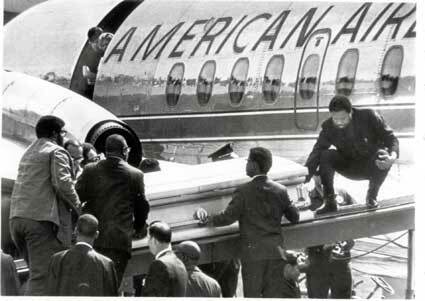 The story was the aftermath of the murder of Dr. Martin Luther King, Jr.
As McClellan writes, he was at the Atlanta airport covering the return of King’s remains for WSB. McClellan was the voice behind a hard-wired live shot as the passengers and cargo emerged. We were the only live shot when the plane landed. Our pictures and my voice were the only ones on all three networks: NBC, CBS and ABC. There were no others in 1968. I was trying to describe what was happening from a distance without being able to see things clearly across the tarmac. Engineers had not had time to set up a monitor. Suddenly beside and beneath me was Jim Axel [of WAGA] with this tiny battery powered monitor. Though we were competitors, Jim held the monitor directly in front of me so I could identify the members of the entourage accompanying Dr. King’s body. McClellan has been writing some retrospective posts of late, looking back at his long career in Atlanta TV news. 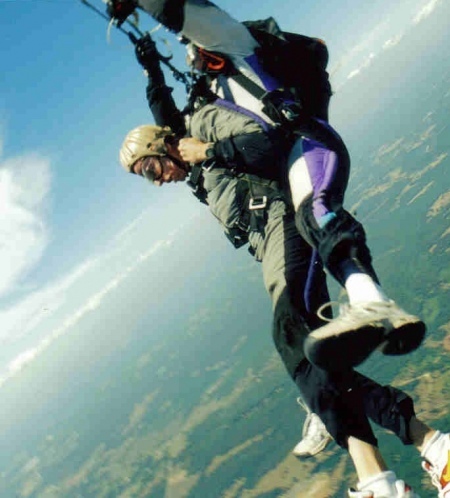 Though he also writes about his medical issues, his marathon running and his skydiving exploits, his recent historical posts are worth reading. He wrote this about his correspondence with King’s assassin, James Earl Ray. Here’s a piece about Mayor Ivan Allen hitching a ride with McClellan following a visit to Atlanta by Lyndon Johnson. Here are two pieces about racially-charged events he covered, one by the Black Panthers and the other by the Ku Klux Klan. Scroll through his blog back to August 2009 and beyond, and another succession of memories-from-TV flows in his posts. Don McClellan’s blog is now linked under “Atlanta TV blogs” to the right. This entry was posted in mcclellan don, shirek jon on November 29, 2009 by live apt fire. 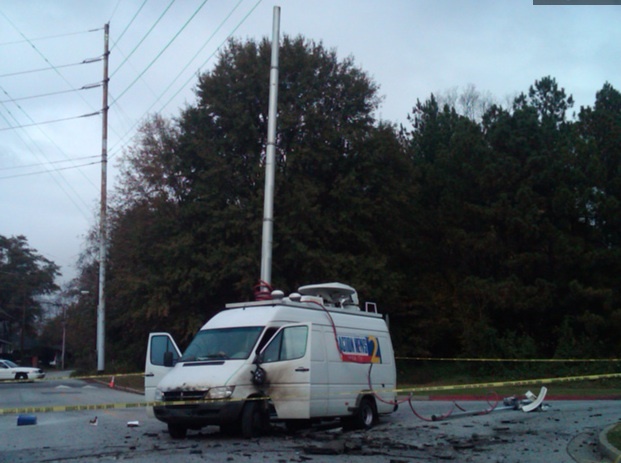 It’s a question that will probably never get an adequate answer: How did a WSB live truck operator / photographer overlook the fact that he hadn’t retracted the mast of his live truck prior to driving away from the Fulton County Jail last Wednesday? As we now know, the crew’s extended mast hit some overhead electrical transmission lines, causing an explosion and destroying the truck. The two-man crew inside somehow survived with only minor injuries. The vehicle’s alarms, which would normally sound and flash when a live truck lurches into “drive,” had been previously disabled. The answer probably lies somewhere in the word “distraction.” It’s happened before. Occasional WSB reporter Don McClellan outlines a similar incident in his blog. McClellan gives no date for it; the photographer was the legendary Dan Casey. Here’s a glimpse; go here to read the entire post. We were at a spot in Cobb county from which we’d sent a micro-wave signal many times before. Dan was editing. I was manipulating the mast controls. But for some unexplained reason, the shot wasn’t getting in that day. We were only about 20 minutes from the station, so I told Dan to keep editing… that I would drive us to WSB. I was so focused on getting the story in on time that I drove out of the parking lot on to Cumberland Boulevard near Cumberland Mall. The next thing I remember is a crash and a horn honking. The mast had hit a tree limb that came down on the fender of a car behind us. I quickly stopped, realized what had happened and lowered the mast. Reading between the lines, a couple of points emerge. One is this: When McClellan put the vehicle into “drive,” apparently no alarms sounded to warn the crew that the mast was up. This indicates how pervasive disabled alarms may be, dating back a number of years. If there’s a problem with an alarm, the protocol would be to report the problem to management. Management would be responsible for fixing the problem. But if the problem is intermittent, then the alarm may be difficult to fix; an alarm that fails to work properly in the field may work fine when the truck gets to the shop (or, to the on-staff technician who sees the same problem over and over and repeatedly applies the same fix). The proper care of live trucks can be problematic, as hilariously outlined in this post (written by somebody who needs to submit more material to LAF, please…). The other safety issue raised in McClellan’s post highlights another commonplace safety-compromising shortcut: The operation of a live truck while a photog (or reporter) is sitting in the back editing. It’s not supposed to happen; the rear cabin is a work area, not a passenger area. But as McClellan shows us, the looming deadline occasionally forces TV crews to be resourceful. Odds are, he and Casey would have missed slot if Casey hadn’t agreed to keep editing while the reporter rolled the truck. It’s also worth nothing that Don Mac was actually “manipulating the mast controls,” which means that he was setting the live shot. This is something most TV reporters have never even tried to do. It ain’t rocket science. But it shows that McClellan was always a nimble, multitalented guy in the field. McClellan’s blog has been fun to explore. I’ll guide you through some highlights in a day or two. If you don’t want to wait, visit it now. It’s linked on “Atlanta TV blogs” in the blogroll to the right. This entry was posted in mcclellan don, WSB on November 23, 2009 by live apt fire. Updated below with remarks from photographer / live truck operator Leonard Raglin. 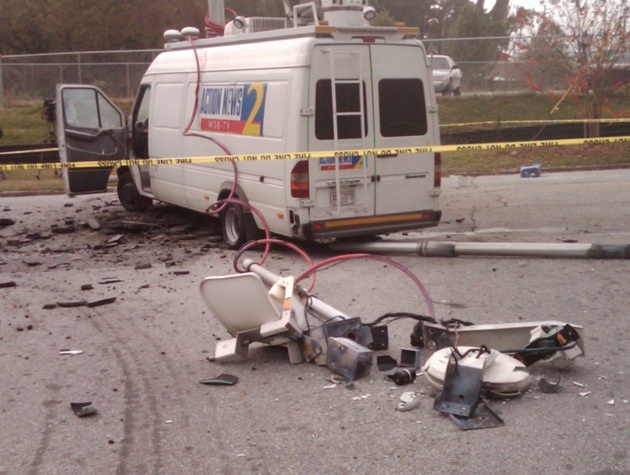 The Occupational Safety and Health Administration has been investigating the near-tragic accident that destroyed a WSB live truck and sent a reporter and photographer to Grady hospital. Cox insiders say WSB is “trying to downplay” the incident out of embarrassment and fear that the station may face fines and / or damages. Aside from a piece on the station’s web site (and a brief mention on a newscast or two), the station has done no follow-ups on the story. Truck operator / photog Leonard Raglin drove out of the parking lot at the Fulton County Jail following a live shot at noon Wednesday. He drove out without first stowing his telescoping microwave mast, extending some forty feet up. As he drove onto Rice Street, the mast hit some 115,000 volt transmission lines, creating an electrical explosion. Reporter Tom Jones agreed to answer some e-mailed questions. What was the shock / explosion like? The explosion sounded like something out of Baghdad. It was horrific and rocked the van. Were you able to keep your wits about you? How? It was very difficult to keep my wits because of the smoke that quickly filled the truck. Then I noticed fire in the back quickly approaching. My photographer was the hero because his training quickly kicked in. He repeatedly pleaded with me not to get out. I wanted to get out because the smoke had overwhelmed me. He made sure it was safe to get out on his side and then properly bunny hopped his way out. He then encouraged me to do the same. What kind of damage was done to your person, clothes, phones, accessories? The fire burned holes in my suit, singed my hair and burned my briefcase. Any way to explain the lapse in protocol following the live shot and the failure to stow the mast? Management is investigating the issues surrounding the mast. Will you be able to work in a live truck again? Of course I’ll be able to get inside a live truck again. As a matter of fact I can’t wait. Life goes on. And I’m very fortunate to be able to say that. Glad you came out of the accident in one piece. I know everybody in the market shares that sentiment. I appreciate your support and kind words. We are truly blessed to be alive. The investigation to which Jones diplomatically refers includes the discovery that the truck’s audible alarm had been disabled. In addition, a flashing light alarm had been been covered with duct tape, say Cox insiders. It’s believed the alarm had been disabled before Raglin and Jones used the vehicle that morning. As discussed here previously, this isn’t unusual. I’ve worked in a truck whose mast alarm would sound whenever the truck hit a bump in the road, even though the mast was properly stowed. I’ve worked with a photog who’d learned how to disable the alarm by reaching under the dash with one hand while driving down the highway, and disconnecting a wire coupling. WSB News Director Marian Pittman visited Jones and Raglin at Grady following the accident. She told a staff meeting the following morning that the employees were still in a mental state of shock hours later. The accident traumatized the entire staff, we’re told. Pittman was tearful while leading the staff meeting, during which she implored employees to take no shortcuts, safety-wise. Raglin is an experienced, talented and widely-respected veteran of the Atlanta market; if one were to create a list of folks capable of such an oversight, Raglin would be near the bottom of the list. His involvement proves that this could happen to anybody. Late Friday, Raglin sent the following note to LAF. Thanks for the concern. God gives much grace in spite of me. He protected Tom and me. Obviously, the mast was up when it should not have been. Georgia Power comes to mind as someone I thank God for. A free seminar they held trained many photogs and reporters how to properly exit a van on powerlines if absolutely needed. Doug tell your readers that a very experienced photographer and technician did something he never dreamed he’d do… even stopped others from doing. That’s driving off with the mast up. When routine things don’t get their proper attention anymore, you can become blind to the obvious. Look up and live! This post now includes a correct photo of Raglin. Thanks to “murrow” for pointing out an earlier incorrect photo. This entry was posted in WSB on November 20, 2009 by live apt fire. A WSB TV crew failed to lower its 40-foot mast following a noon live shot at the Fulton County jail today. 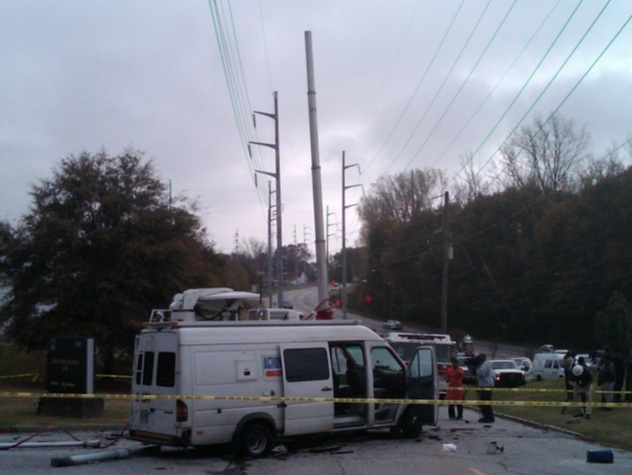 WGCL reports the operator drove the truck, mast extended, into some power lines. That triggered an explosion which damaged the truck and sent a surge of electricity into the ground below, damaging a water main. Amazingly, the crew survived and sustained only moderate injuries. Tom Jones was the reporter on the story and presumably riding in the passenger’s seat when the accident happened. 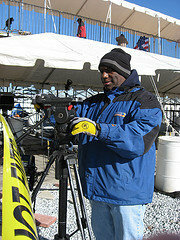 Leonard Raglin, a longtime WSB and WXIA veteran, was the photographer / truck operator. The photos also show that the power lines are straight-from-the-substation transmission lines. Samler reports they carried 115,000 volts. 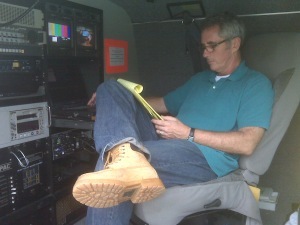 The safe operation of a live truck is a drill that’s recited in TV newsrooms at least as often as the fact-checking essentials of newsgathering. Trucks have warning labels, front and back, that remind the operator that you can be killed if the mast comes into contact with a power line. Yet live trucks are also part of the mind-numbing newsgathering routine at many TV stations, where perhaps a majority of stories are delivered with the help of these vehicles. Truck operators aren’t supposed to get complacent. If they do, it can be deadly. The most dangerous part of the mast vs. powerline encounter can come afterward, when the crew is trying to exit the electrified vehicle. If the truck comes in contact with power lines, the crew is taught to jump forcefully out of the vehicle, so that they aren’t in contact with the ground and the vehicle at the same time. Morse Diggs actually demonstrates this during WAGA’s coverage of the accident. In this case, Samler tells LAF that it appears the truck lost contact with the power lines after the top of the mast blew off. This means the electrification of the truck was powerful but brief. It ruptured the asphalt below the truck. It set the engine on fire. And it somehow spared Raglin and Jones from serious injury. Most live trucks I’ve ridden in have ear-splitting alarms that go off if there’s even a hint that the mast isn’t stowed. The alarm goes off the instant the driver puts the truck into gear. On rare occasions, the alarms go off erroneously. As deadlines approach, the operator’s only choice may be to temporarily disable the alarm. Sometimes those alarms don’t get fixed, and the subsequent truck operator may not know that this safety device isn’t working. It’s not clear what happened in this instance. Samler narrates the video below. Like him, I’m delighted that I’m not writing about a fatal accident. 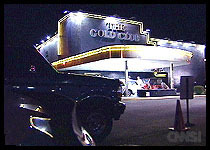 This entry was posted in jones tom, WGCL, WSB on November 18, 2009 by live apt fire. It’s not easy to irritate the cadre of reporters assigned to cover your campaign for Mayor. But it can be done. Exhibit A is Mary Norwood, the onetime frontrunner in the Atlanta mayor’s race. On Wednesday, Norwood called a news conference at 4pm, a curiously out-of-context “tribute to veterans.” It was Veterans Day, but it had an odd “let’s state the obvious” quality about it: We love our veterans. Norwood’s people knew that three of the four local TV stations had newscasts at 4pm or 5pm. The 4pm news conference was a headache, timing-wise, for the TV folks covering it. Earlier that afternoon, third-place finisher Lisa Borders endorsed Kasim Reed in the runoff. Norwood had lobbied for the same endorsement. Her people knew that reporters were covering the “tribute to veterans” for one reason: To get Norwood’s take on the Borders endorsement. Norwood unhelpfully walked into the room downtown at 4:15pm, fifteen minutes late. With no podium available, TV photogs clipped a bunch of lavaliere mics to Norwood’s jacket. She launched into her veterans appreciation spiel. A half-dozen or so armed forces veterans stood alongside her, mostly silently. A TV reporter asked a question about the Borders endorsement. Norwood gave a broad, unspecific answer. Another TV reporter rephrased the question. Norwood rephrased her unspecific answer. At this point, Norwood’s spokewoman Zee Bradford stepped in front of the candidate and began to abruptly remove the microphones clipped to the candidate. With her back to the cameras, Bradford muttered something about another upcoming event on the schedule. Another reporter barked a question to Norwood. The candidate awkwardly walked away. The next day, the Norwood campaign called a news conference to respond to endorsements of Reed by Borders and former Governor Roy Barnes. But as Ernie Suggs reported in the AJC (in a piece headlined “Where is Mary Norwood?”), Norwood was a no-show. Bradford told reporters that Norwood was “out campaigning” Thursday, but couldn’t provide a way to rendezvous with her for a comment. The tension is audible in Odette Yousef’s piece on WABE radio. Later, the Norwood camp said Norwood was actually shooting a campaign commercial Thursday. Norwood’s week wasn’t as bad as it had seemed. The Borders endorsement of Kasim Reed hadn’t helped. But it wasn’t a surprise. (There was a similar endorsement in the last mayoral race in 1997; third place finisher Gloria Bromell-Tinubu endorsed second-place finisher Marvin Arrington. Bill Campbell still won the runoff.) The Roy Barnes’ endorsement wasn’t much of a surprise either. The surprise was the campaign’s ability to foul its relations with the media by overlooking some simple tenets of courtesy: Show up on time, answer the questions, respect deadlines, don’t bait-and-switch with a news conference featuring an absent candidate. And don’t mislead when asked about her absence. Kasim Reed’s campaign is getting this stuff right. Lisa Borders’ campaign got it right. Some politicians provoke and feed on media hostility. Bill Campbell did it. House Speaker Glenn Richardson does it, to some extent. Likewise, I recognize that campaigns don’t exist for the convenience of the news media. On the other hand, Mary Norwood’s history has always been one of accessibility and courtesy. One-on-one, she’s engaging, humorous and personable. Given an opportunity, Norwood will chat with a reporter until the reporter runs out of questions. This happened Monday when, with campaign manager Roman Levitt’s help, I talked with Norwood outside of City Hall. She had no handlers present. Unprovoked, she expressed regrets about the previous week’s media mismanagement. “I wish the staff would have handled that differently,” she said. A sucker for honesty, I felt sympathy for her. She’s in the political fight of her life. A WXIA poll released Monday showed that her commanding lead has disappeared. Norwood’s week hadn’t been great. Her communications staff had made it much, much worse. This entry was posted in Norwood Mary, WABE on November 17, 2009 by live apt fire. Longtime WAGA anchor / reporter Jim Axel lost his battle with cancer Saturday morning. He was 75. Axel was always an inspiration to me. When I first realized that big-market daily TV news had the capacity to quickly burn out a young career, I would look at Axel and watch the way he handled it. In 1986, when I started at WAGA, Axel had been temporarily dethroned as the station’s nightly anchor. At that time, he worked the streets as “senior reporter.” He returned to the anchor desk when WAGA started its 5pm newscast. Axel was smart, passionate, occasionally surly and uncompromising in his standards of journalism. He had a twenty-plus year head-start on me, career-wise. If he could do it, I figured — maybe I can. He could be funny and solicitous one moment and gruff and short-tempered the next. He was of an age when news anchors were hard charging and larger than life. Jim took his role seriously. The news mattered. The trust of his audience mattered. His reputation mattered. If you were his producer, you developed a thick skin. If you stood your ground with Jim, he respected you, but you had to earn your stripes every day. I can remember countless times asking him to write a minute and a half piece on the big national or international story of the day, only to be met with a sharp rebuke. He’d storm back to his desk, and I wouldn’t hear another word until he returned, glasses perched on his nose, asking me to read his copy. “It’s too long,” I’d say. Somehow it always came together, and we’d both end up reasonably satisfied, our mutual if grudging respect intact—at least until the next fight. After he was diagnosed with cancer, Shavin produced a TV retrospective on his career. It was based on an interview Shavin conducted with Axel in spring 2009. To see it, click here. I’ll wear a red tie to work Monday, an Axel tribute suggested by his longtime colleague, sports guy Bill Hartman. The red tie was Axel’s signature look. Services for Axel are still pending, according to WAGA’s web site. This entry was posted in WAGA on November 14, 2009 by live apt fire. Whew. That’ll teach me to doze off during CSI:NY. I’ve lived in Atlanta forever. I’m an ex-WAGA reporter, ex-CNN freelance correspondent. I’ve learned to expect certain things from my local news. I woke up from my nap to see WGCL’s 11pm newscast… which I probably hadn’t watched in years. It felt as if I’d awakened in a parallel universe. Dagmar opened the show… lotsa rain. Weather. Then a live shot remote local story on its impact… then back to the set and I saw that Lou Dobbs was on the exit ramp… fine. Ok. Then I think they went to a break… and they came back with the Wendy Saltzman Show. Wendy Saltzman B-Block: They take their truck (laden with 3 hidden cameras) to 10 local auto shops/oil change businesses. Funny business ensues. Wendy harasses various owners, mechanics… asking the “Tough Questions.” They have their own mechanic expert… and he says most of the stuff done was either done badly or needlessly. Five stations ripped them off… 5 stations did ok. Decent story, but low hanging “investigative” fruit. Wendy Saltzman C-Block: Wendy again… and they are throwin’ around the “Tough Questions” shtick in all the lead-ins (tiresome). Wendy finds the Fulton Co. School board has been paying a lot more than the general public on a multi-million dollar contract for all sorts of stuff…paper, crayons, printers. The funny stuff here was Wendy chasing down the boardmembers and them dodging her. Amusing… Ok, semi-amusing. Afterward it dawned on me… hadn’t I seen this before? Turns out I’d read about it on this very site… in June! 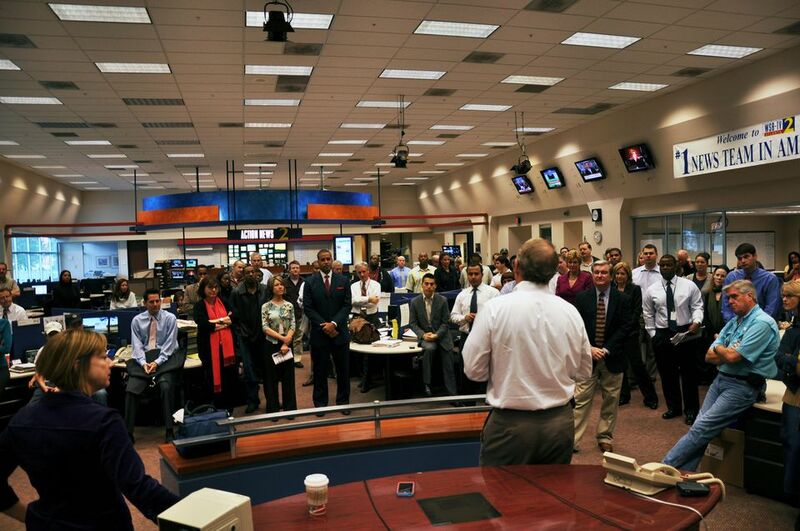 WGCL had foisted on its viewers a five-month-old investigation. At least the episode of CSI:NY wasn’t a re-run. Wendy Saltzman D-Block: Wendy…. Again?? Where is everybody?? This time (more Tough Questions… even more tiresome) Grady Hospital has bad and broken down ambulances. Ok, serious stuff… life and death… maybe. But this is less of a story and more of a pitch for folo-up stories. More to come. Then it’s the End of The Show!! I checked back on my Tivo… from 11:13 ’till 11:33 it was All Wendy… All the Time? Did a bomb go off in the newsroom?? I know they are outsourcing Sports… but none… no Sports, nothing… no other reporters. It was the strangest newscast I have seen since I left Topeka, Kansas (1980). Adding to the intrigue… I’d known WXIA had been experimenting with reformatting its 11pm news, devoting the back-half of a newscast to one concept. Interesting… WXIA had one of those newscasts last night at 11. Like WGCL, WXIA had devoted the last 15 or 20 minutes to one concept. WXIA had been promoting it since late last week. Coincidence? I’d say WGCL is counterprogramming WXIA. If I worked at WXIA, I think I’d be flattered. If I worked at WGCL, I might ask: If my name isn’t Wendy Saltzman (or Dagmar), can I still get on TV, please… with a fresher story produced sometime since Independence Day? Jamieson is honcho / founder at Broadcast Solutions. This entry was posted in saltzman wendy, WGCL, WXIA on November 12, 2009 by live apt fire.